Is it worth it? The time? The money? The sacrifices? Those were just a few of the questions running through my head and heart as I stood over the washing machine a number of years ago moving a load into the dryer. It was not a good season in many ways. I was serving full-time in a local church with very little help. We had two young and overly energetic boys. My wife was expecting baby number three in about two months. The real struggle was in her experiencing premature labor and thus confined to mostly bed rest. She was out of commission and I was wondering what in the world I was doing taking grad-school classes. The questions were logistical and about motive. Am I doing this for the right reasons? Do I really need to pursue an MA? Can’t I just as well serve my present job and calling fine with what I have? Then as I was reaching down to pull out the last handful of clean clothing I sensed the Holy Spirit confirming that I needed to stay in the fight. Earlier that evening I had been upstairs with the boys while Deb was lying down reading. Toys were scattered around and mounds of clothes were reminding me that I had plenty to do that night. Yet somehow the boys and I had stopped to watch the BBC. Honestly I can’t remember too many of the specifics from the program. I just know it was covering an isolated village deep in the African continent. It was in the middle of nowhere. An overall hopelessness seemed to be the norm for this people group on the edge of the world. We were disconnected in so many ways. But something grabbed me. The fact of the matter was that it was absolutely impossible for those people in Africa to attend just one of the classes I was taking much less secure a whole degree. I, on the other hand, was another story. Some place in my heart I sensed a clear message that despite how hard life was at this point; I needed to finish my MA simply because I could. God had placed an opportunity and calling in front of me to accomplish. It now seemed that completing the degree was more of a responsibility than a privilege. I knew then that all questions were out of bounds and the path was clear. I had to get this task completed. It wasn’t until this past year that I actually made it to Africa with Marked Men For Christ. 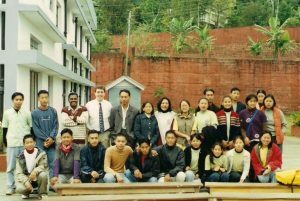 But those years ago shortly after I finished my MA I got a call from some missionaries requesting help teaching leaders in India. It was obvious. What I had learned in grad school and in ministry was exactly what these people needed. In one real sense, I had finished my MA for them. Over the years I’ve met lots of great people who felt a tug toward formal Biblical and theological training but for whatever reason pulled back. Maybe you started and then the mounds of clothes in life caused you to flinch. I get that. It is tough at times. But as one who has walked this road, I’d really encourage you to keep pushing forward. Why should we complete any formal studies that God puts before us? Because we must! Who knows, someone on the other side of the globe just might be depending on us to do so.